A group of University of Arkansas at Little Rock employees, students, and alumni who created a space-western storytelling card game – dubbed Galactic Scoundrels – have reached their online fundraising goal to raise enough money to have the game manufactured, breaking their fundraising goal by more than $10,000. 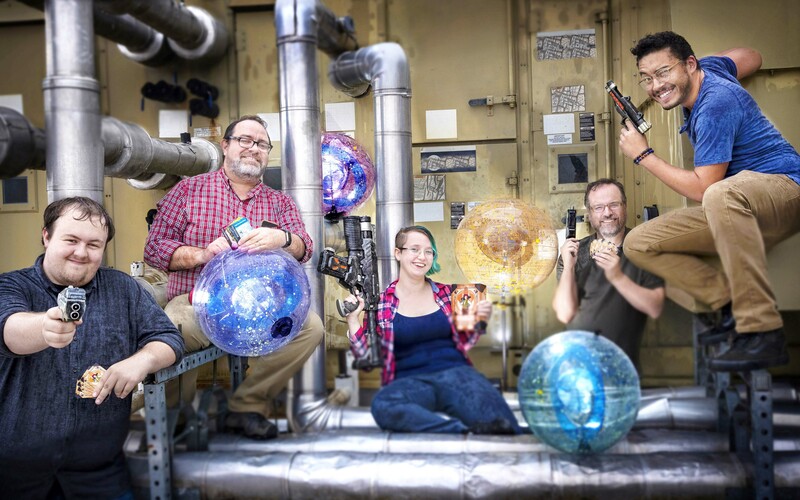 The creators of Galactic Scoundrels include Joseph Williams, associate professor in the Department of Rhetoric and Writing, Tanner Marshall and Olivia Dunlap, graduate students in the Department of Computer Science; Brad Sims, instructional designer and media specialist for the College of Education and Health Professions; and Robbie Hunt, UA Little Rock alumnus. Kevin Cates, associate professor of graphic design, joined the team and created all of the art for the game. Williams and crew, who co-founded the Little Rock Game Designers group in 2014 and last year formed a company called Little Rock Games, started a Kickstarter campaign to raise enough money to have the game manufactured. The game creators set a goal of $17,000. By the end of the campaign on July 25, a total of 666 backers donated $27,430 to turn the game into a reality. Galactic Scoundrels is inspired by beloved fictional scoundrels like Han Solo from “Star Wars” and Malcolm Reynolds from “Firefly.” Players gamble and bluff each other to win a job and then tell the shared story of that job by playing cards. Each job is a mini-adventure lasting 15-20 minutes with spaceships, crew, cargo, strange and wonderful characters, and exciting twists. The game has simple rules, which can be learned in about 10 minutes. This allows players to emphasize storytelling, negotiation, and social interaction. Their Kickstarter backers reached two stretch goals – a funding target set by the project creator beyond the original Kickstarter goal – meaning that gamers will receive a thank-you gift from the Galactic Scoundrels creators in the form of 10 additional game cards that will create extra twists and turns in the game. Williams said they are planning an initial run of about 800 games that should be delivered to their Kickstarter backers in January 2019. Meanwhile, the developers are already working on their next game. Dunlap and Marshall came up with the idea for a video game called To The Rescue, where players learn how to run an animal shelter and help real-world shelters by supporting the game.